Sparkling Adventures -✯- There's hope for our house yet! There's hope for our house yet! We have been living in the ugliest house on the street, but slowly, slowly things are coming together. 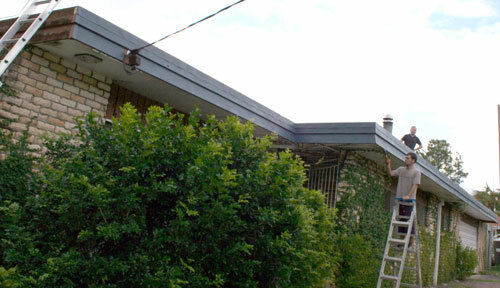 David and his worker Greg started painting the facia board on our house yesterday. It will be terrific to finally get rid of the mission brown (still visible in the far right)! I told you our property was getting a touch of the Smurfs — everything is turning blue! Tonight, Brioni fell asleep while eating her dinner. She would nod off, then reach out for another mouthful of couscous, raise her head long enough to put the food in before her chin fell down again onto her chest.